Depart Australia or New Zealand in the late evening on suggested Emirates flights to Addis Ababa via Dubai. Renaissance Tours or your travel agent can assist you with your flights and other travel arrangements. 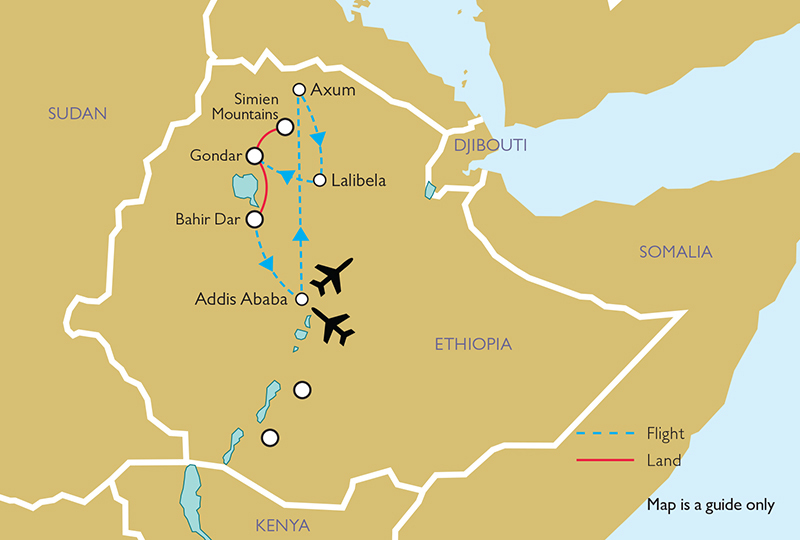 Arrive in Addis Ababa in the afternoon on suggested flights and transfer to the hotel (included in tour price). In the evening, join Jane and fellow travellers for welcome drinks, followed by a special welcome dinner. After an introductory talk on Ethiopia in the morning, enjoy a full-day tour of the capital city, Addis Ababa, including visits to the eucalyptus-covered Mt Entoto, former site of the Ethiopian royal capital, and Entoto Maryam Church and Museum. Also visit Shiro Meda, the city’s traditional clothes market, and the National Museum, where Ethiopia’s oldest resident, the 3.2-million-year-old Australopithecus afarensis ‘Lucy’, is housed. This evening, enjoy a traditional Ethiopian dinner, with music and dancing from various Ethiopian ethnic groups. In the morning, explore the Ethnological Museum at the University of Addis Ababa, an extraordinary display of the grand sweep of Ethiopian history and its varied cultures, housed in what was once a palace belonging to Emperor Haile Selassie I. Continue to the Holy Trinity Cathedral, the highest-ranking Ethiopian Orthodox church in the capital. 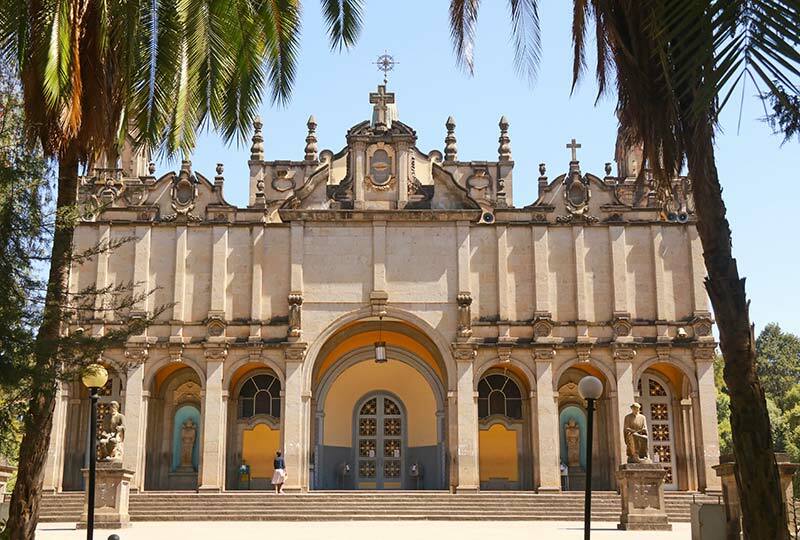 Built to commemorate the liberation of Ethiopia from Italian dominion in World War II, the ornate cathedral boasts carved statues, murals and impressive stained-glass windows, and it houses the tombs of Haile Selassie and his wife Empress Menen Asfaw. After lunch, visit the Addis Ababa Fistula Hospital. Founded in 1974 by Australian obstetrician-gynaecologists Dr Catherine Hamlin AC and Dr Reginald Hamlin, the hospital was the first in the world dedicated to the relief of obstetric fistula (the tearing of the birth canal during childbirth), a condition particularly prevalent in developing countries and associated with health complications and social ostracisation. Since its foundation, the hospital has opened five other centres across the country, now treating as many as 4,000 women a year. All patients are treated for free. In the early morning, check out of hotel and transfer to the airport for a flight to Axum on the northern border of Ethiopia (included in tour price). The ancient capital of the Kingdom of Axum, a naval and trading power that flourished between the 1st century BC and the 10th century AD, Axum is one of the oldest continuously inhabited cities in Africa, and its rich history is recalled in its stone stelae, churches, monasteries, tombs and ruins of fine palaces. Visit first the ruins of Yeha, dating from the 8th to the 5th centuries BC, and thought to be the capital of Ethiopian civilization before Axum. Continue to Adwa, site of the famous battle where the Ethiopian Empire threw back the forces of the invading Kingdom of Italy in 1896, preserving its sovereignty as one of only two African nations (along with Liberia) not subject to European colonisation. The leader of the Ethiopian forces later ascended the throne as Emperor Menelik II, and he remains a figure of esteem and respect amongst Ethiopians. Enjoy a talk in the late afternoon by Jane. Spend a day visiting the religious and historical sites of Axum. See the archaeological museum and the famous granite stelae, erected from the 5th century AD onwards to mark noblemen’s burial chambers, including the 24-metre tall Great Stela of Axum looted by Italian forces in 1937 and only returned in 2005. Visit the Queen of Sheba’s Bath (which supplies water to Axum year-round), King Ezana’s inscription, King Kaleb’s tomb, King Bazen’s tomb and the Queen of Sheba’s Palace. Also see St. Mary of Zion church, where the Ark of the Covenant is kept, visible only to a chosen guardian monk. 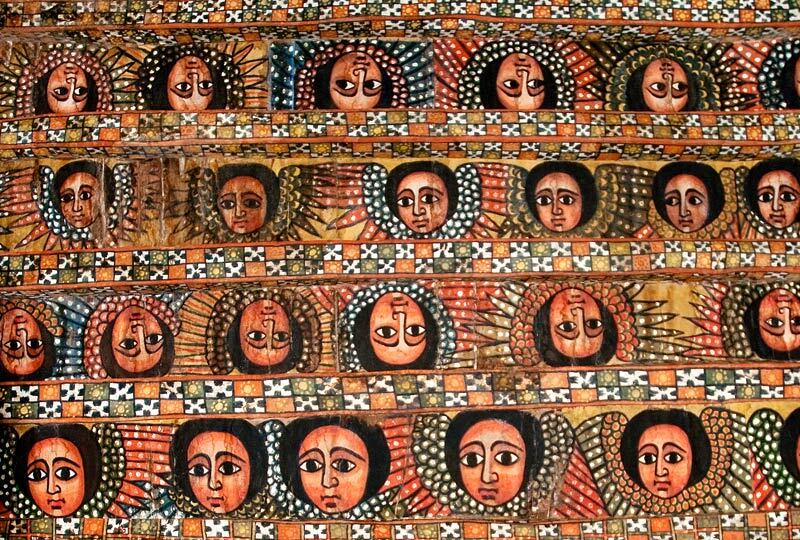 Afterwards, visit the colourfully-decorated Church of Arbatu Ensessa, the interiors of which are adorned with lively depictions of saints and angels in the distinctive Ethiopian Orthodox aesthetic. Check out of the hotel and depart on a morning flight to Lalibela (included in tour price), the most famous of all Ethiopian historical sites. One of Ethiopia’s holiest cities (second only to Axum), Lalibela is a centre of pilgrimage for much of the country. After lunch, start your tour of the rock-hewn churches of Lalibela, all carved into a single great hill of basalt (solidified lava) and tuff (consolidated volcanic ash) on the Ethiopian Plateau. Visit the northwestern cluster of churches, and see the 12th century Bet Medhane Alem, home to the holy relic the Cross of Lalibela, Bet Maryam, thought to be the oldest of the Lalibela churches, the chapel of Bet Meskel, the simple Bet Danaghel, and Bet Mikael with its cruciform pillar. In the morning, enjoy a talk by Jane and then visit the church of Yimrehanne Kristos. The most popular of the churches outside of Lalibela, this church is built with layers of wood and granite, set in the entrance to a large cavern. Then return to Lalibela for lunch and, in the afternoon, visit the southeastern cluster of churches. Visit Bet Gabriel-Rufael, thought to have been a royal palace, Bet Merkorios, thought to have been a prison, Bet Amanual, possibly the royal chapel, and the small Bet Abba Libanos, which legend tells was constructed in a single night. 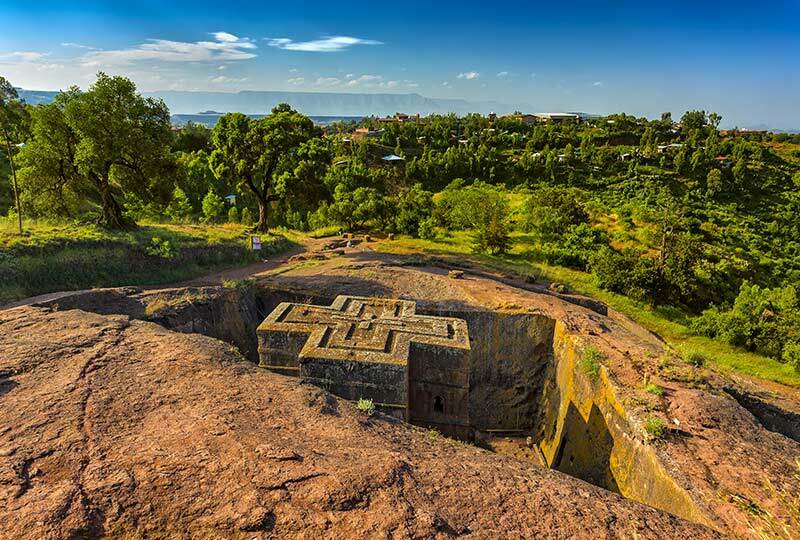 Finally, visit the most famous of all the rock-hewn churches, Bet Giyorgis, constructed in honour of the patron saint of Ethiopia, Saint George. Bet Giyorgis is the best executed and best preserved of all the Lalibela churches. After breakfast, transfer to the airport for an early morning flight to Gondar (included in tour price). 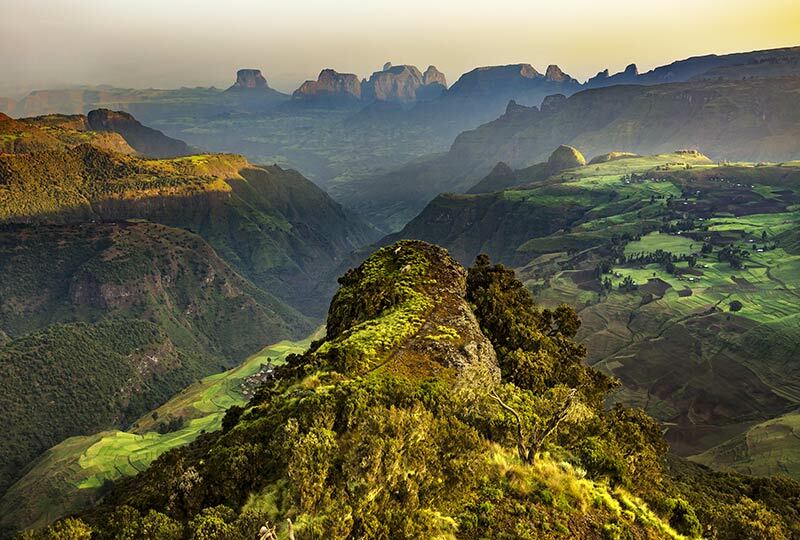 Enjoy breath-taking views of the UNESCO World Heritage-listed Simien Mountains, where high basaltic pinnacles are separated by steep escarpments and broad upland plateaux, all covered over in verdant swathes of grass. Arrive in Debark, gateway to the Simien Mountains, and following registration proceed into Simien Mountains National Park. This extraordinary park includes the 4,550-metre high peak Ras Dashan, the highest point in Ethiopia, the name of which appropriately means ‘Chief Guard’ in Amharic. Travel to Sankober, with beautiful views over both sides of the escarpment. 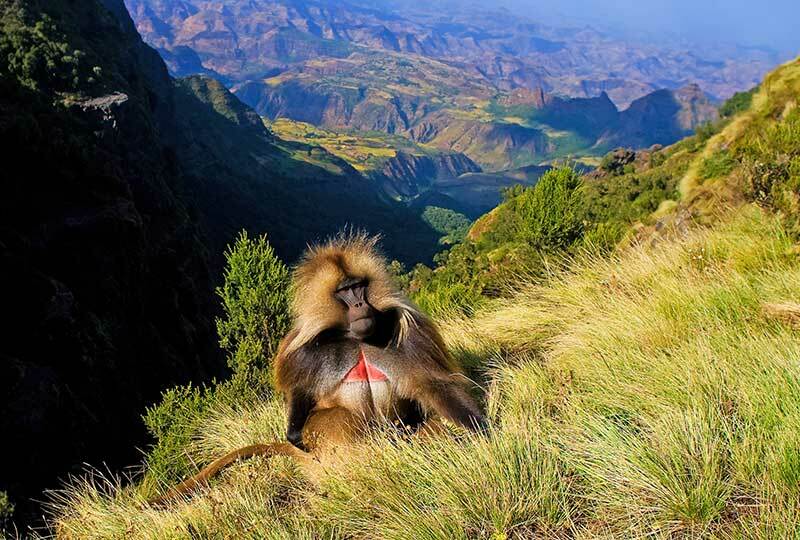 Gazing over the broad grassy expanse, you may have the opportunity to see great troops of gelada baboons (Theropithecus gelada), the world’s only grass-eating monkey. Then travel onwards to the Geech Abyss waterfall, where the Jinbar River plunges into the abyss. After a picnic lunch, continue to Chenek, where the sharp-eyed might catch a glimpse of soaring lammergeyer vultures (Gypaetus barbatus) and the rare endemic walia ibex (Capra walie). Check out of the lodge and return to Gondar. En route, visit the Ploughshare Women’s Training Centre to see how women preserve their traditional handcrafts such as cotton-spinning, weaving and pottery. Arrive in Gondar in the late afternoon and check in to the hotel. After some time at leisure, enjoy a talk by Jane, followed by dinner at the hotel. Spend a full day exploring Gondar, the capital of the Ethiopian Empire from the mid-17th to the mid-19th centuries. Ethiopian Emperors traditionally had a ‘moving capital’ that followed them wherever they went in the country, but after Emperor Fasilides was led to a choice riverside spot in Gondar by a docile buffalo, he decided to build a permanent royal capital on the spot – one of history’s few examples of a buffalo serving as a city planner. 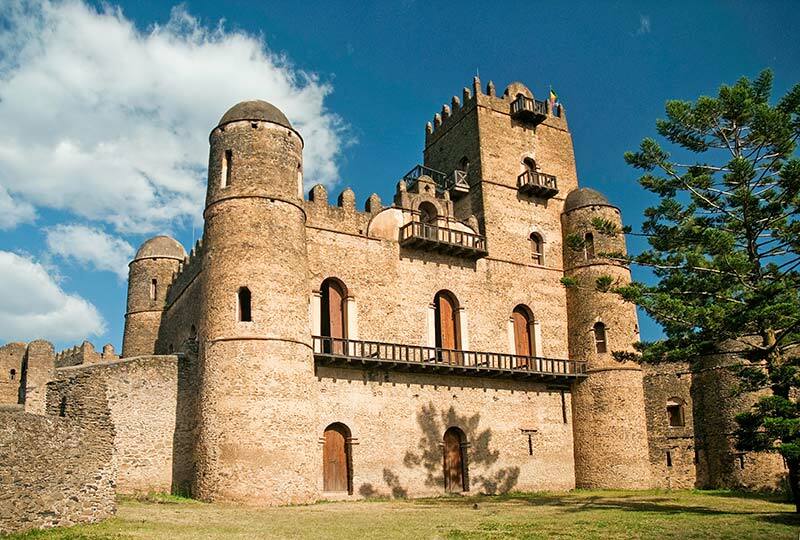 Visit the Royal Enclosure, including Fasilides’s evocative Castle of Gondar which has earnt the city the moniker the ‘Camelot of Africa’, as well as several other castles and official buildings. Also visit Fasilides’s Pool, still used for Timket (Epiphany) celebrations today, the Ras Gimb Palace Museum, the melancholy ruins of Kuskuam and the Debre Birhan Selassie Church, with the most famous ceiling in Ethiopia, every inch covered with frescoes of smiling cherubim. After breakfast, travel south to Bahir Dar through rural villages which offer a fascinating glimpse into Amhara culture, the dominant culture of northern Ethiopia and the ethnicity from which the Solomonic Dynasty of emperors hailed. Along the way, visit the unique village of Awra Amba, which practises equality for all members of their society. These egalitarian ideals, particularly as between the genders, are a relative rarity in Ethiopia, and in Awra Amba all have equal access to health care, education and employment. The village is home to a successful weaving co-operative. Arrive in Bahir Dar in the early afternoon, followed by some time at leisure. Bahir Dar is situated on the southern shore of Lake Tana, the largest lake in Ethiopia and the source of the Blue Nile. 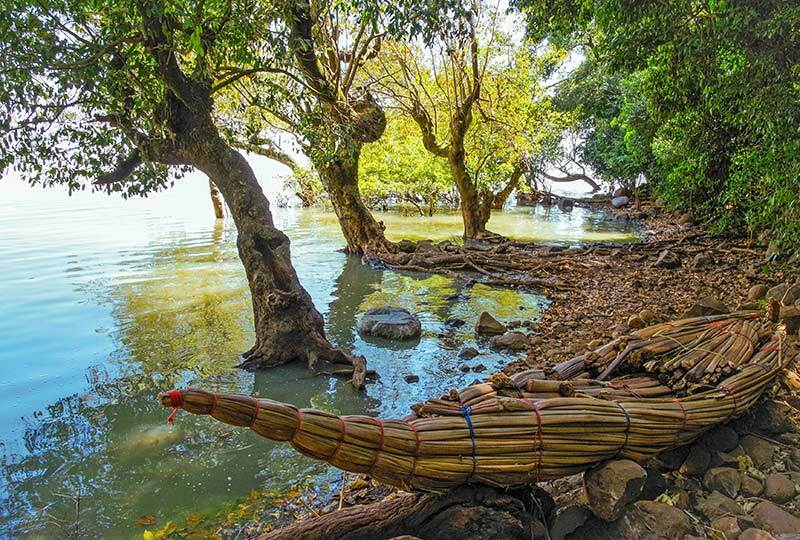 After breakfast, take a boat trip on Lake Tana to visit a selection of the monasteries hidden on the islands and shores of this sacred lake. 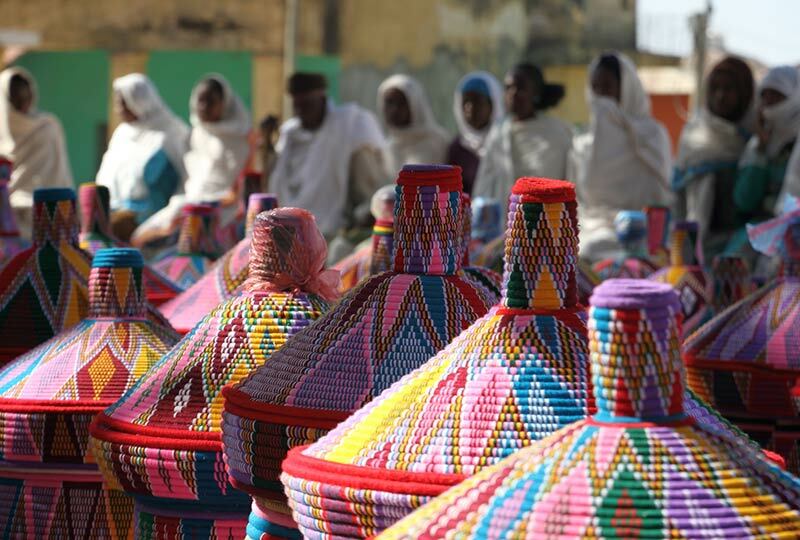 Visit the Zege Peninsula and the monasteries of Azuwa Maryam and Ura Kidane Mehret, and the island monastery of Debre Maryam near the outflow of the Blue Nile River, where men still make traditional tankwas (papyrus reed boats). In the afternoon, take a city tour of Bahir Dar including a drive to the Bezawit Hill, overlooking Lake Tana and the Blue Nile and the site of one of Emperor Haile Selassie I’s palaces. In the morning, drive out to the Blue Nile Falls. The falls form an important ecological division between Lake Tana itself and the Nile river system, and the impassability of the cataract has allowed distinct fauna to evolve on the lake and river sides of the falls. Transfer to Bahir Dar Airport for an afternoon flight to Addis Ababa (included in tour price). Check in to the hotel, and then in the evening celebrate the conclusion of the tour with a special farewell dinner with Jane and fellow travellers. The morning is at leisure to say farewell to the city of Addis Ababa, with the opportunity to visit some of its charming churches or perhaps do some shopping for colourful Ethiopian handicrafts. At noon, check out of the hotel and transfer to the airport (included in tour price) in time for suggested Emirates flights to Australia or New Zealand via Dubai departing from 15:30 onwards. Renaissance Tours or your travel agent can assist you with your flights and other travel arrangements, including any additional nights’ accommodation, either before or after the tour. Australian and New Zealand passport holders require a visa to visit Ethiopia (obtained online in advance of travel). Renaissance Tours will assist you with this process.